Selkirk 'A' against Edinburgh Accies 2s, in the blue and white stripes (picture by Grant Kinghorn). Beneath the coating of mud is Selkirk ‘A’ player Andrew McColm, touching down for a try against Edinburgh Accies 2nds in their Tennent’s National Reserve League Division Two meeting. Unfortunately, the Souters’ second XV went down 12-23 on Saturday to the side from the capital city. 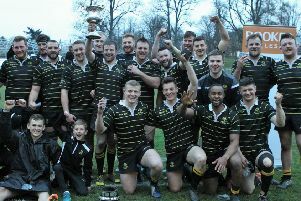 This weekend, Selkirk ‘A’ are due to travel to meet Kelso ‘A’ (photo by Grant Kinghorn).